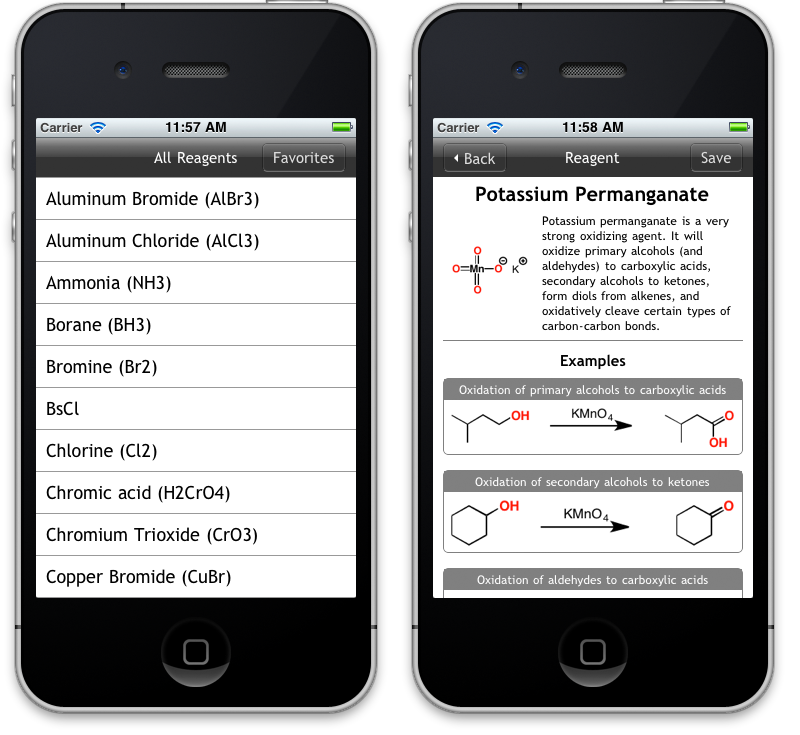 Reagents is a new app for iPhone and iPad that gives you all the key information about the most commonly encountered reagents in undergraduate organic chemistry courses. Profiles of over 80 reagents, along with their key reactions. Examples of each of the representative reactions of each reagent. There’s hundreds of example reactions in all, from commonplace to obscure. A “Favorites” List – so you can make your own list of only the reagents which are most important to you. You can always modify your list as you progress through the course. And for a limited time it’s also free. More efficient studying. Spend less time hunting down information: all the key details for every reagent are accessible in seconds. Less time being lost in class. Need a refresher on that reaction? Forgotten what that reagent does? You can look each reagent up in a snap. Study wherever you go. It’s all on your iPhone – so you can finally cut that umbilical cord between you and your textbook. They’re working away on their homework and suddenly need to remind themselves of what a certain reagent (let’s say NaBH4) does. So they have to pull out their 1000 page textbook to look it up. Except… the textbook points them to multiple pages, some of which are relevant, some not. After a minute or two, they get the information they need. Until… five minutes later, when they need to do this again, and again. Hunting through a huge textbook for tiny pieces of information can be a pain. What students kept telling me is that they wanted an “abridged textbook” that covered all the reagents in organic chemistry. To help solve this problem, I developed the Reagent Guide, which puts all the reagents of organic chemistry on your desktop. Now, in collaboration with Metamolecular, the Reagent Guide has been adapted for the iPhone and iPad. The result is Reagents – a pocket encyclopedia of all the most common reagents in organic chemistry. It gives you the comprehensiveness of a textbook, but with all the convenience of a mobile app. Now you can answer the question, “What does that reagent do again?” in a few seconds. And then go back to your work. In other words, you can spend less time searching for information and more time actually studying. Hey, did you see that Reagents is free? This is great! Unfortunately I don’t have an iPhone, merely an Android, will there be an Android app as well? I’m in the same boat, and would also like to express interest in an Android version. This looks awesome! What an incredible app. This is something I dreamed about doing with flash cards, but you’ve done me one better. AND free? I’ll take it. Thanks Christine, I’m really interested in hearing the perspective of instructors on this. Any hope of you possibly acting to create a virtual chemistry model kit like the one you described in one of your previous posts? If so that would be awesome~!!!!! Not sure how to build it yet, but that’s something I’d love to do. Can the Regeants App also be downloaded to a laptop? No, it’s only for mobile devices. The Reagent Guide has everything that’s in the app, plus mechanisms and more examples, as well as extra summary sheets. It’s available as a downloadable PDF. great looking app. I hope to try it if you release an android version. my sense is that there is a larger population of science people and students on the andoid platform than on iphone. That’s possible – it’s a little harder to develop for due to a larger variety of hardware devices, and also that neither of us have Androids. We’ll let you know when one becomes available. Lots of interest in an Android version. Funny thing is I use the Reagent Guide primarily on my Android. I have a PDF viewer app. It would be easier to navigate if it were in an actual ‘app’ form, but I don’t have much trouble as it is, it would just be nice to be able to search (which I can’t do on my PDF viewer on my Android). Keep up the great work James!! Thanks for the interest – those who want a droid version have not been shy, and that’s great. I agree in wanting to make search an option for the Reagent guide – the problem is in how it was made in a pretty old-school way (chemdraw to PDF) and a future version should correct that. Not sure it will be soon however. This is great! However, I am disappointed that this wasn’t broadly publicized (especially when it was free). It does work very well though! Trust me, we tried to publicize it as broadly as we could. Hello there, I bought your app and was wondering: How much more information is there in your pdf reagent guide? Seeing as it is 5x the price of the app is there 5x more information? There are extra summary sheets and mechanisms for reactions. It’s also something you can print out and have on your desktop. Regarding price, I think the Reagents app is ridiculously underpriced for what you get. PLEASE PROVIDE FOR WINDOWS PHONE TOOO.